Preparation time: 15 minutes. Baking time: 20 minutes. Preheat oven to 350°F and coat a 9″x13″ baking pan with vegetable cooking spray. Mash one can of the beans with a spoon or in a blender or food processor; set aside. Sauté the onion and green pepper in the vegetable broth until tender, about 2 to 3 minutes. Add 1 cup picante sauce, the mashed beans, and the can of whole beans. Stir the mixture and heat thoroughly. Spoon about 1/3 cup of the bean mixture down the center of each tortilla and roll it up. Place the tortillas seam-side down in the baking pan. Combine the remaining cup of picante sauce and the tomatoes; spoon over enchiladas. Cover with foil and bake for 15 minutes. Uncover, sprinkle with cheeses, and bake, uncovered, for 5 more minutes. 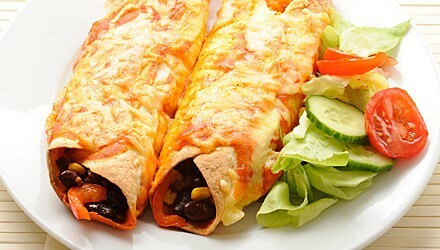 To serve, place 1/2 cup lettuce on each plate and top with two enchiladas. Garnish with sour cream, if desired. Exchanges per serving: 3 starch, 1 lean meat. Carbohydrate choices: 3.